The lengths I go to for my obsession with movies. It was only this morning I realized that the BAFTAs were on in the morning, during school time. What was I to do? Well I got the tweets from BAFTA through my phone, but it was even luckier that the majority of the awards happened during first period, in which case I was in ICT (computing class). 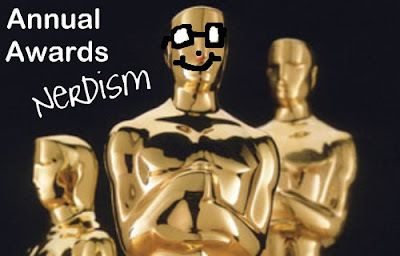 Unfortunately, two of the main awards, best actor and film, spilled over into period two, when I had English, and it was virtually impossible to sneak a peek at my phone the whole hour. When it came time for interval, though, all hell broke loose when I found that The King's Speech swept up, leaving The Social Network nowhere to be seen. But then I realized, those British people really liked The King's Speech, and hopefully that won't be the case at the Oscars (two weeks!). The King's Speech mob and their mob of awards. -I don't care how great everyone thinks The King's Speech is. It is a fantastic movie, but it is my least favourite out of the nominees here, and the nominees I have seen at the Oscars, for that matter. Oh well, I'm happy it won, but The Social Network is better. -You know what's cooler than winning Best Film? Winning Best British Film, too. The King's Speech did that. -I guess Jesse Eisenberg went the whole awards season without winning anything. In fact, I'm sure every actor in the lead role went the whole award season without getting anything. Congrats, Colin Firth. Though I still think you are getting all these awards for your work in A Single Man. -You go Natalie Portman. YOU ARE THE SWAN QUEEN! -This was a WTF moment for me. Helena Bonham Carter is great and all, but I thought they would have gone with Amy Adams. Then again, HBC probably won't upset Melissa Leo's Oscar campaign. Andrew Garfield and Jesse Eisenberg hold David Fincher's award very tightly in fear that Tilda Swinton may steal it. ﻿-I love that David Fincher won Best Director. I mean, there's supposed to be that film/director thing going on, right? Well Finch broke that right up. It would have been better if Christopher Nolan won, though. -Everyone except the Writer's Guild will keep ignoring Christopher Nolan's script for Inception and keep going for David Seidler's 'original' one for The King's Speech. Sweet as then, brothers. Aaron Sorkin and his bagillionth award...and Julianne Moore. -The editing in The Social Network is good. I don't mind this award going to them. -Costume Design for Alice in Wonderland. Seriously? Hasn't everyone forgotten about that movie now? -I give up on campaigning Hans Zimmer's amazing Inception score to win. It never gets me anywhere. Thanks to no The Social Network, The King's Speech gets its sticky beak in here, too. -Makeup/hair for Alice in Wonderland? Guess that makes partial sense. -Best Sound for Inception. Just because everyone knows its amazing. -Inception gets Special Effects, too. Because it actually looks real, y'know. -It makes me laugh that The Secret in Their Eyes didn't win Best Foreign Film even though it won an Oscar last year. Well deserved win for The Girl with the Dragon Tattoo, though. -SHOCK! Toy Story 3 won Best Animated. -N-n-n-noooo Andrew Garfield for Rising Star? Sad. But Tom Hardy is a good choice, since we'll be seeing him everywhere soon. -Did anyone bother to turn up? Like, 50% of the people I saw winning awards couldn't be there. Natalie Portman is understandable though, since she is preggers and all. Random hobo Gerard Butler with Darren Aronofsky and Natalie Portman's award. ﻿﻿-On the subject of Portman, the speech Darren Aronofsky gave on her behalf was awesome. So true that she didn't have to thank anyone. -Colin Firth is a funny bugger. Tom Hooper is apparently as thorough as his routine health check. I wish I could be Amy Adams. ﻿﻿-Amy Adams is beautiful. Particularly in that dress. -Rosamund Pike was funny. So was the crack Gerard Butler made at her. -Helena Bonham Carter's speech was perfect. Love her. That's a wrap for the BAFTAs. Now only the big one to go. Is The King's Speech going to continue sweeping up there? Just because it is Nicholas Hoult in a suit and it's Valentines Day and I am lonely :( HAPPY VALENTINES DAY MY LOVELY READERS! Gerard Butler totally looks like a random hobo in that picture! Nice work though, very entertaining! I was somewhat surprised too. Mind you, Tom Hardy is in like every future movie, so he will be the next big thing, per se. Haven't seen Bronson myself, but what I've seen in the trailer was cool, so I'm guessing Hardy deserved it. Hans Zimmer is the man!